All training is scheduled on-demand when requested by Contributing Member Agencies. If there are no seats available, you may still register, which places you on the waiting list. Seat fill occurs on a first-come, first-served basis as they become available. Wait lists help determine additional training demand. Course Descriptions available. Click the course title for specific information. Contributing Member Agency Employees are Free unless noted. P = Private Sector, Non-Local Government, etc. 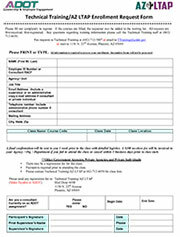 Complete and Submit a Technical Training Registration Form now to sign up for LTAP classes.